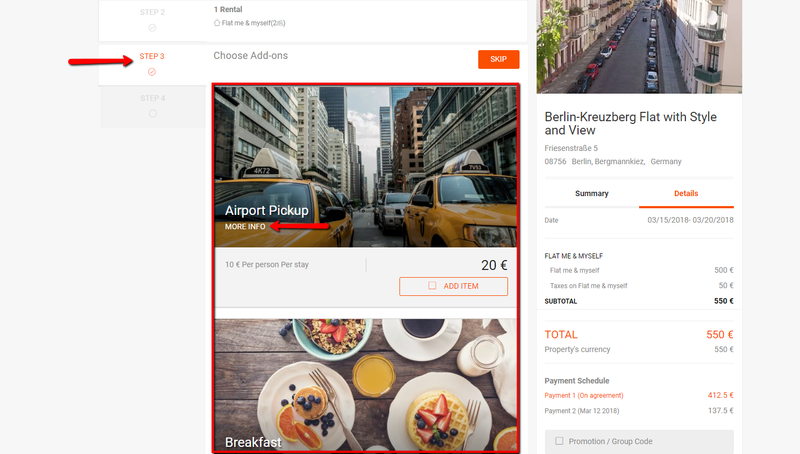 Use Add-ons so that special services such as breakfast or airport pick-ups can be booked directly together with the room booking. Also, find out how to manage your Add-ons and apply restrictions. Select the property you want to edit, click Edit and go to Rates. Scroll to the bottom of the page for the Add-on section. Then click Add an add-on to either add an existing one or create a new one. 💡 Note: Don't forget to create the Add-on in different languages. During check-out, your guest will see the Add-on in Step 3 of the check-out process. 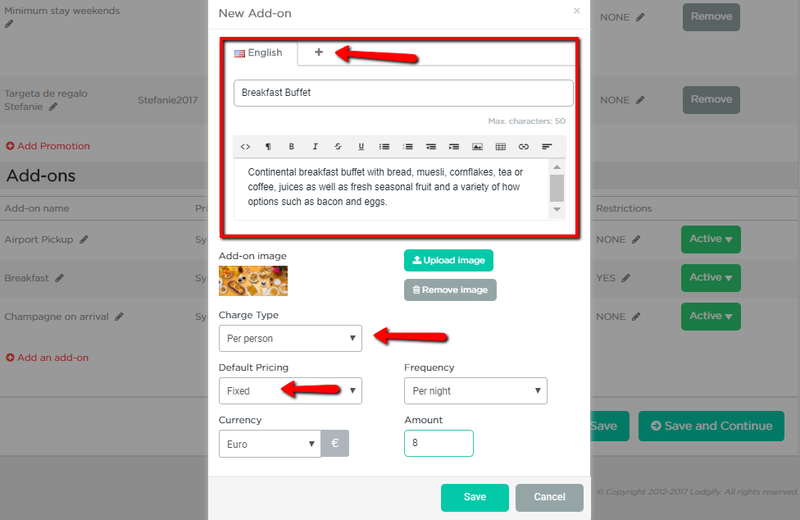 Once the Add-on is created you can select if you want to offer it with all properties or only specific ones and make amendments to the price. You can also decide at any point to deactivate or delete an Add-on. Restrictions If you wish to offer the Add-on only for a certain room type/property or not offer it during a certain time of the year use the Restrictions. Go to the Add-on you want to edit and under Restrictions click the little pencil icon. Select for which room types/properties you want to offer your Add-on and Add a period when you don't want to offer the Add-on. Use default Add-on price for all properties If you wish to apply the same price of the add-on to all properties you applied this add-on to, switch on the Use default function. If you prefer to apply a different price for each property, switch it off. If you wish to deactivate your Add-on for the moment or delete it, click on Active and select Inactive or Remove from the drop-down menu.